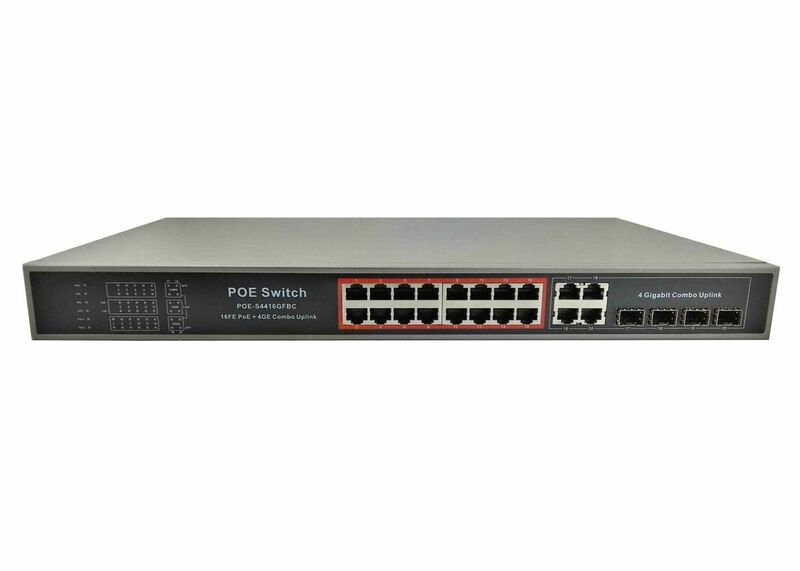 POE-S4416GFBC is 16 ports Fast Ethernet unmanaged Power over Ethernet switch, it comes with 4 port Gigabit RJ45&SFP combo uplink, comply with IEEE802.3af/at and equipped with 350W internal power supply source, which enable every single PoE port supplies maximum 30W power, and they pass through pins 1,2 "+" and pins 3,6 "-" over standard Ethernet cable cat5 least, cat5e, cat6, cat6e or higher quality level are recommended as it will greatly reduce power loss in the long transmission between PSE and PD in the Ethernet power system. 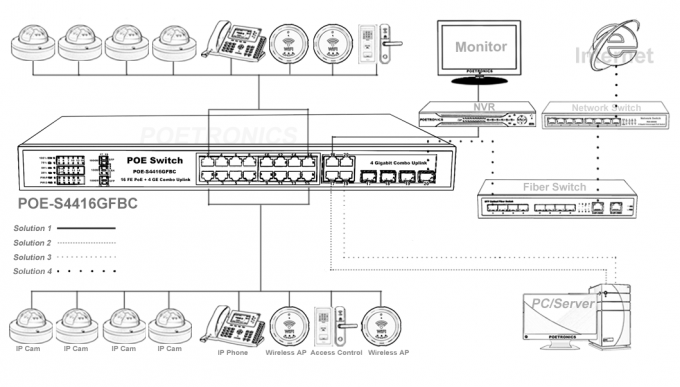 It's primarily work with PoE compatible Powered Device such as Voice Internet Protocol Phone, Wireless Access Point, CCTV IP camera, Intelligent Access Control, Portable device or other PDs as required. Finally, It also comes with rack mounting kits that allows it easy to be installed on rack or cabinet. 16 port 10/100Mbps POE + 4 10/100/1000Mbps RJ45 & SFP Combo uplink. Compliance with IEEE 802.3af/at, 12.8G Bandwidth. Max 30W for every single port, total rated output power 350W. Plug and play, self-adaption, grounding connection, 19’’/1U rack mountable. PoE working status can be read and troubleshot through LED indicators on front panel.